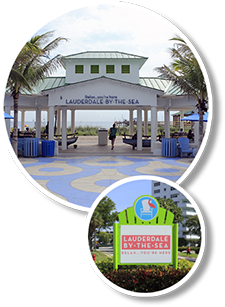 Lauderdale-By-The-Sea (LBTS) is a small seaside Town nestled between the two larger beach towns of Fort Lauderdale beach (south) and Pompano Beach (north). You’ll know when you’ve entered LBTS, with its colorful street signs and banners and then find our iconic colorful beach umbrellas and Adirondack chairs dotting the sidewalks and in Anglin’s Square, located near Anglin’s Pier. When you get here, you’ll notice that Lauderdale-By-The-Sea is only a few blocks wide and long, so you can easily get around without a car! Walking is the best way to get around LBTS – with all of our stores and restaurants within a five block area, a nice stroll is the easiest way to get around. Walking Map hard to read? More friendly printer version here. Nothing is better than peddling around our little Town! 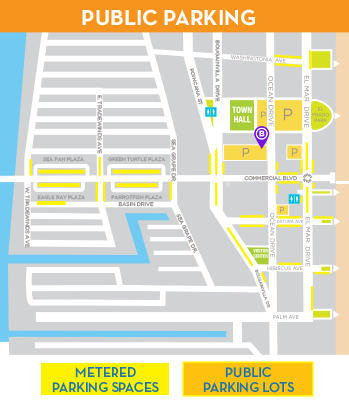 Bike rentals are available at Pedrito’s Bike Shop on Commercial Blvd, or at B-Cycle rental stand on A1A just north of Commercial. 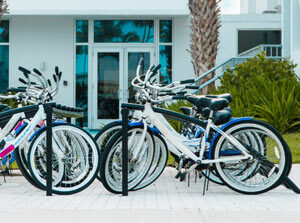 Many hotels such as Plunge Beach Hotel have complimentary bikes for your peddling fun around Town as well. Hopper operates seven days a week through Town, south to just north of Oakland Park Boulevard and west to Holy Cross Hospital (Monday through Saturday only). Monday – Thursday: 9 a.m. to 5:25 p.m. The Water Taxi’s nearest stop to LBTS is south of Town, at Bokamper’s in Fort Lauderdale, just north of Oakland Park Blvd. on the Intracoastal Waterway. Take the Pelican Hopper to Stop #6 and you are a just a stroll away from Bokamper’s Water Taxi stop. 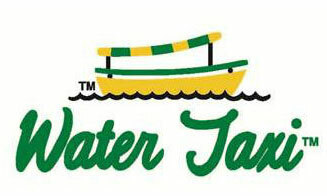 View the Water Taxi pricing and schedule for more information on routes and to buy tickets. 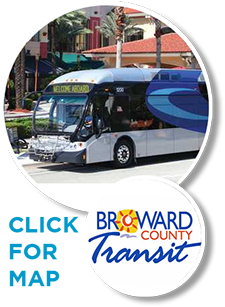 For more information and to view the full routes, visit the Broward County Transit website. AMTRAK can take you from anywhere in America to the Orlando station, where you can ride all the way to Fort Lauderdale. Brightline is the only privately owned, operated and maintained passenger rail system in the United States. By providing express rail service you can easily travel to and from Lauderdale-By-The-Sea to Miami and West Palm Beach from the Fort Lauderdale station (the closest station to Lauderdale-By-The-Sea). Tri-Rail is a more frequent train option to take you from West Palm Beach, all the way to the Miami Airport. When taking Tri-Rail, hop off at the Cypress Creek Station. From there, you can take a taxi, Uber or Lyft to Lauderdale-By-The-Sea. 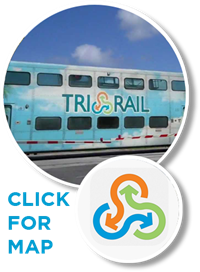 Visit the Tri-Rail website for their full schedule. Take the Tri-Rail train to the Fort Lauderdale Airport (FLL) or Miami Airport (MIA), which takes you right into one of the terminals at MIA, and to FLL with a quick shuttle over to the terminals. Fort Lauderdale/Hollywood Airport (FLL) is a 30 minute car ride from Lauderdale-By-The-Sea by car. You can take the BCT #1 bus to the main bus terminal, then transfer to the #11 that will bring you straight to LBTS. Tri-Rail can also take you to the Cypress Creek station, and then take Broward County Transit bus to Lauderdale-By-The-Sea. Or, there’s an airport shuttle just outside the arrival doors in each terminal. Miami International Airport (MIA) is about 50 minutes away, just south of Lauderdale-By-The-Sea off of I-95. Tri-Rail has a stop in one of the terminals that will take you to the Cypress Creek train terminal just a few miles north of Lauderdale-By-The-Sea, where you can catch a Broward County Transit bus to Lauderdale-By-The-Sea. There are also transportation shuttles that will bring you up to Lauderdale-By-The-Sea. There are also, bus connections to MIA, please contact Broward County Transit for more information. West Palm Beach International Airport (WPB) is a bit further north of Lauderdale-By-The-Sea. Check Tri-Rail schedule for their southbound routes. Also, check connections on the new Brightline high-speed train to Fort Lauderdale. 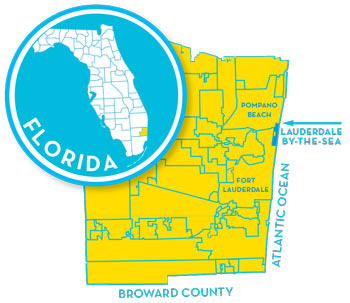 Once at Fort Lauderdale Brightline station, you can walk next door to Broward Central Terminal and board the Route 11 bus to Lauderdale-By-The-Sea. No change? No Problem! Get the PayByPhone App for your iPhone or Android and be ready to park when you need it!